SHANGHAI, April 18, 2017 - HARMAN International, a wholly-owned subsidiary of Samsung focused on connected technologies for automotive, consumer and enterprise markets, announced today a new platform solution that intelligently integrates all of a car’s digital displays and the information and services behind them. 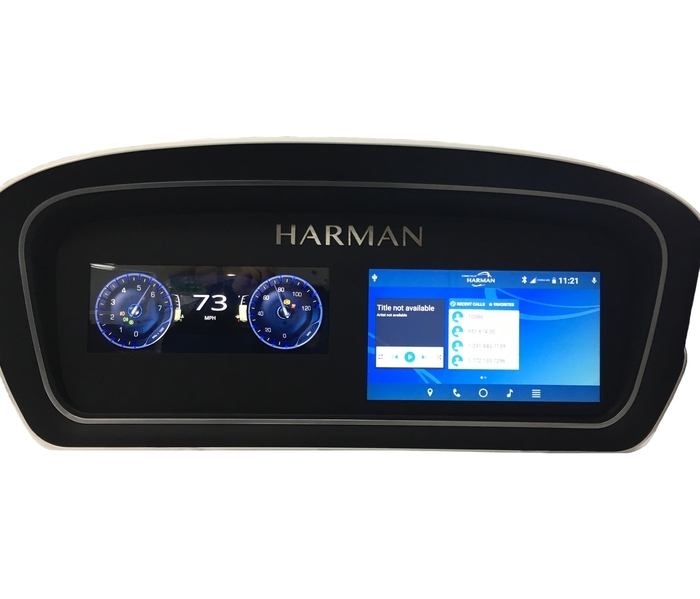 HARMAN’s new Digital Cockpit Platform is a scalable and cost-effective solution that integrates the operation and functionality of the instrument cluster and center stack infotainment system to deliver a more seamless user experience. The increasing digitization of vehicle displays, safety and entertainment features has often led to a fragmented and confusing user experience in the car. At the same time, automakers are faced with managing the increased complexity of these in-car electronics, often with increased costs for multiple controllers and software solutions to manage these disparate systems. HARMAN’s new Digital Cockpit platform addresses these challenges through a compute platform that is capable of driving multiple functional domains within the car, including the center displays and infotainment, instrumentation cluster, advanced driver assist systems (ADAS), audio and sound management, lighting, e-mirrors, navigation, drive assist, and even an intelligent personal assistant. The scalable approach allows Harman to offer cost-effective cockpit solutions addressing the broader vehicle segments. Additionally, automakers can now use HARMAN’s Digital Cockpit Platform to offer drivers a vastly improved experience that harmonizes the visual look and feel between all in-car systems, as well as improve system flexibility and performance. HARMAN’s digital cockpit platform was brought to life through rigorous benchmarking that meets industry requirements for performance, security, stability and functional safety. Critical vehicle functions are always prioritized for fail-safe operation enabled by a Type 1 hypervisor. For increased system protection, a safety-critical real time operating system is used to drive the instrument cluster and HUD display, while the rich infotainment and connected experience is powered either by Android or Linux. All of the platform systems can also be “future proofed”, thanks to HARMAN’s Ignite IoT solution that provides services and over-the-air (OTA) update capabilities that have been integrated within the platform. New features and functionality, as well as bug fixes or software upgrades, can be easily transferred to the car, ensuring that the in-vehicle experience stays as fresh and current as other aspects of the driver’s digital life. The entire system is also secured from the “inside-out” by leveraging HARMAN’s industry-leading 5+1 security framework. HARMAN is already working with a leading European OEM to deliver a digital cockpit solution. HARMAN is showcasing the Digital Cockpit Platform at Auto China Shanghai 2017 in booth 8A02. HARMAN (harman.com) designs and engineers connected products and solutions for automakers, consumers, and enterprises worldwide, including connected car systems, audio and visual products, enterprise automation solutions, and services supporting the Internet of Things. With leading brands including AKG®, Harman Kardon®, Infinity®, JBL®, Lexicon®, Mark Levinson® and Revel®, HARMAN is admired by audiophiles, musicians and the entertainment venues where they perform around the world. More than 25 million automobiles on the road today are equipped with HARMAN audio and connected car systems. Our software services power billions of mobile devices and systems that are connected, integrated and secure across all platforms, from work and home to car and mobile. HARMAN has a workforce of approximately 30,000 people across the Americas, Europe, and Asia. In March 2017, HARMAN became a wholly-owned subsidiary of Samsung Electronics.